have we worn off old restraints. Nearly 20 years after writing this poem, my Dearly Beloved and I are heading toward our 52nd wedding anniversary in the fall of 2017. Over half a century. Good grief, that’s almost as long as old people written up in newspaper articles are married! Being an old couple has its challenges, but there are also many blessings. Who knew? We are still each other’s solace and comfort, and the years have worn us into a fit for each other’s bumps and hollows and prickly places. We’re Real together. Real, and loving – and loved. 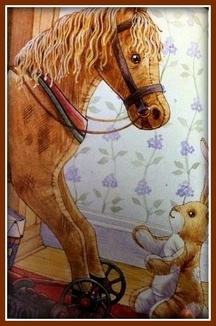 That entire conversation between the Skin Horse and the Rabbit is one of my favourites. So much wisdom condensed into those few passages! Thanks, Deany! It’s one of my favourites, and I couldn’t resist reposting it. I’m glad you like it too. Hugs, S.
Thank you so much! I love writing and would do it no matter what, I expect, but I can’t tell you how much it means to me that other people appreciate my writing. Thank you for your lovely comment. So nice that you reposted this one. I remember reading it when you first posted it. It spoke to me then and even more so today. Challenges and blessings, all intertwined as we grow old and become real together. Thanks again Sue for your words of wisdom. Thank you, Lorrie. It’s my favourite, I think, of all the poems I’ve written over the years. I’m so happy that other people like it too!